No idea what World Voice Day is? That sounds good to me, anything that raises awareness of the voice, how we use it and the potentials of it works for me! Back in 2012 a group of like minded people coined the idea of “World Voice Day”. They wanted to make everyone aware of how important the voice is for humans and animals alike. I mean, it’s an essential tool of life – the voice allows us to communicate with each other, to express ourselves, and if you’ve ever lost your voice then you’ll know how frustrating it is not to be able to speak properly. Even just having a voice contributes to our life as a whole – it allows us to learn, to teach and to develop language. But not only that, it’s a built-in instrument, one that we carry around with us everywhere and can use at any time. Who wouldn’t want to celebrate that?! We have a dedicated day for it? Yes! Even though the voice is an amazing piece of kit in itself, we still need to keep it in good shape and look after it everyday. World Voice Day is all about this – keeping the voice in a healthy condition and looking after it is essential to it’s normal function. It’s important to raise awareness of a healthy voice, as so many professions can suffer if the voice isn’t looked after correctly. For example, teachers and lecturers are amongst a growing number of people to suffer from vocal issues, it’s not just singers! You can keep your voice healthy by drinking plenty of water, using good vocal technique, not shouting or screaming and by warming up the voice before a performance or public engagement, to name but a few! The most important thing to remember is; if you suffer from a hoarse voice on a regular basis – go get checked out for possible vocal damage. You don’t want to regret it! If you’re a singer and want to improve your voice, a vocal coach who understands how the voice works can be a lifesaver. Make sure you get in touch with us if you’re thinking of taking vocal lessons! As part of the celebrations for World Voice Day, there are lots of different events happening across the world over the next few days. 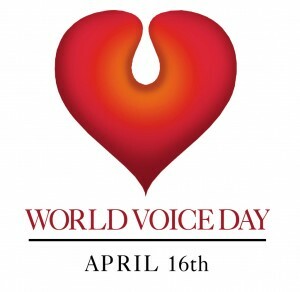 Visit http://world-voice-day.org/category/wvd-events/great-britain to see what’s happening in the UK for World Voice Day! Here at Your Voice Studio, every day is Voice Day! We are all about the voice, raising awareness of good technique, keeping it healthy, making you the best singers you can be ,and that’s why we teach the IVA Technique. For more information, please visit the IVA website where you will find lots of useful stuff, and we’ll be happy to answer any questions you may have! Just get in touch with us via the website or book a lesson to find out more. Well, it’s up to you now! Go get celebrating, and let us know what you’ve attended and what you learnt!